use the org.eclipse.ui.intro extension point to register an intro part implementation and bind this intro part to your product. implement the org.eclipse.ui.intro.IIntroPart interface and use this class as the class attribute in the above extension point contribution. run your Eclipse based product with the correct product id. An intro part is registered with the workbench. 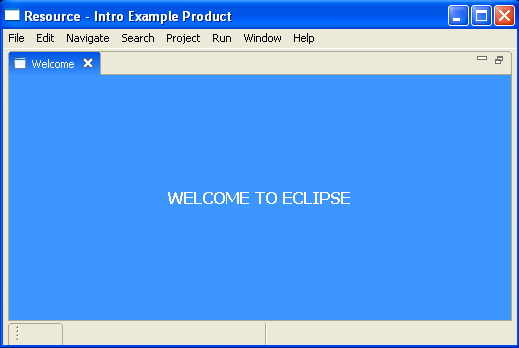 The class that implements this intro part is org.eclipse.ui.intro..HelloWorldIntroPart . An icon is also registered with the intro part and it will appear at the top right corner of the intro part window. An introProductBinding contribution tells the workbench that the intro part we just created is bound to our product with the id org.eclipse.ui.intro.HelloWorld_product. On startup, the workbench looks for the first intro bound to the current product, and instantiates the class registered with this intro contribution. The third and last step is to make sure you run the correct product. For example, if you are self hosting, create a new runtime-workbench launch configuration, choose the "Run a product" option, and select org.eclipse.ui.intro.HelloWorld_product from the dropdown. Note that the intro part is in control of the full real-estate of the window. A more elaborate intro part can be created that interacts with the workbench and progressively reveals the functionality of the product.